‘The Little One’ is the Ultimate Golf Training Aid. ‘The Little One’ by PSP golf makes you a better ball striker. Maybe even a great ball striker. The concept is simple. 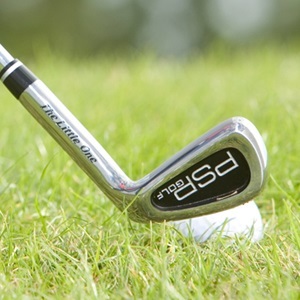 Practice and warm-up with ‘The Little One’ who’s club face is 40% smaller than a typical iron. Your mind becomes laser-focused. Concentration is magnified and your muscles adjust and adapt to the smaller club face. When you go back to using a standard-size club, you feel like you can’t miss. When it’s time to start your round, pure ball striking comes easier. Practice with PSP Golf’s ‘The Little One’ training club on a consistent basis, and you will add distance, increase your accuracy and lower your scores. We’re so confident you will be pleased with the results, that we offer a 100% money back guarantee. Don’t wait! Order today and you will become a better ball striker!